Watermelon fruit bowls look so beautiful on a barbecue or cookout food spread. They are easy to make and look super impressive! Simply follow these easy step-by-step instructions and fill with your favorite fruit salad or dip recipe. Razor blade knife or craft knife. With a large sharp knife, cut a very thin slice from either long side of the melon. Making the bottom flat will allow the melon to sit upright without wobbling. It also makes it much easier to cut the edges out of the top of the melon! Place the watermelon on it's cut side. Place the knife about 1 inch to the left of center and slice the melon completely through. Turning the melon as you cut it if necessary. Use the melon baller to remove the pulp from the top slice, reserving for fruit salad, then discard the top. The reserved bottom will become your basket. Use a melon-baller to remove edible watermelon pulp and reserve for fruit salad or other use. you can also carve out the melon with a regular knife or scoop it out with a spoon. 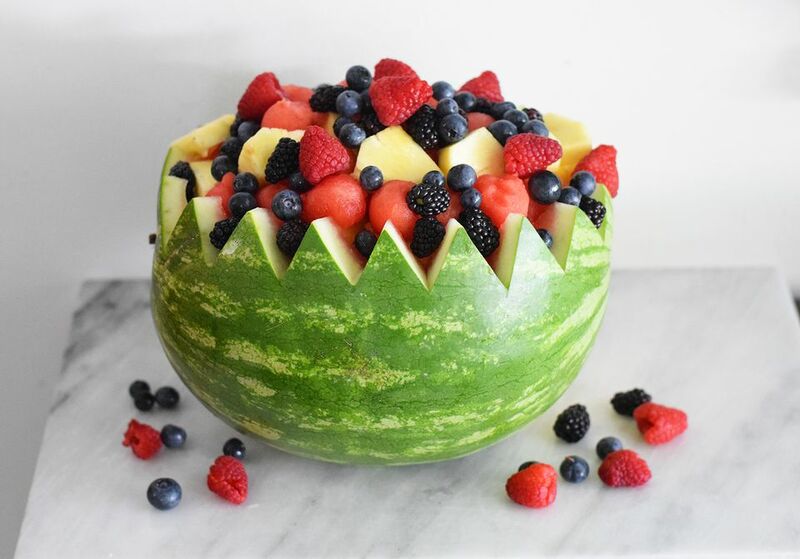 The balled melon looks the nicest in the fruit salad, but you can also cut it into chunks! Carve evenly-spaced V-shaped notches around the top edge of the watermelon bowl. Have them connect to form the zigzag shape at the top. It you are look to create a round edge, space them farther apart and then round the edges with your sharp knife. Fill the finished bowl with fruit salad or dip.